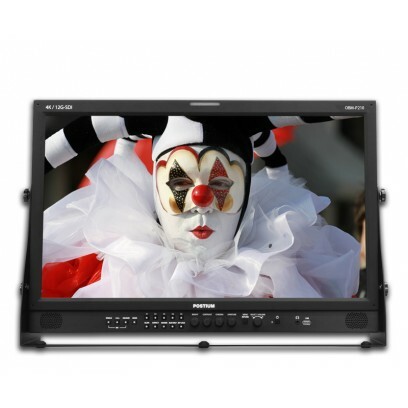 Enjoy superior picture quality, wide viewing angle and other professional features with the OBM-P series by Postium. It incorporates dual scalers, which enables the display of two different SDI signals on the screen. Postium HDR function allows users to view both highlights and shadow detail of scenes at tha same time, thus resulting in more natural and realistic images. Any pictures taken in either light or dark environment can be easily watched or analyzed. The unique Picture-by-Picture function of the OBM P series allows two different SDI input signals to be displayed on the screen simultaneously. This function is very convenient for making instant adjustments to two input sources, because there is no need to individually adjust the different characteristics of two monitors. The OBM P series offers the various Picture-by-Picture modes as follows. This function allows to magnify the either image of the two inputs in PBP mode. The OBM P series can display Waveform, Vector Scope on the two different SDI videos respectively, which is very useful and convenient for dual monitoring. The area of the two pictures to be displayed is selected using a vertical WIPE pattern. This function is useful when picture detail of the two images must be examined on a pixel basis. The OBM PBP function allows to adjust the colour settings to either of the two imanges and compare the two images. HDR / SDR Brightness, Contrast, Colour Temperature, Camera Lut, and other colour settings can be changed. This unique function allows to display the same image side by side, change the colour settings to one image, and then compare the original image and the changed image on the screen.